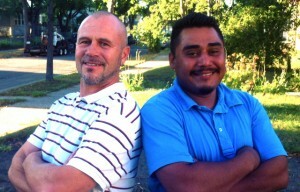 Minne-Mex Construction LLC is owned by Jose(Ivan) and Marque. Minne-Mex LLC officially began in 2011 with support from Urban Homeworks in North Minneapolis. However the two of us have been friends and working together much longer. In the fall of 2007 Jose came to Minneapolis, he met Marque and their friendship began. Marque was working at the time for the Sanctuary Community Development Corporation and had been a resident of North Minneapolis for over 20 years. Jose quickly became involved in the community. In 2008 he traveled to Mississippi to help rebuild homes damaged by Hurricane Katrina. That fall he enrolled in the Tree-Trust / Urban Homeworks job training program. Jose completed the program in the spring of 2009 as the top student in his class. We then started to seek-out through Urban Homeworks and community residents. When the opportunity came to incorporate, we choose our name to represent our lives: Minnesota meets Mexico and visa virsa. Our business and friendship both have grown. We have both had the opportunity to visit the other’s home communities; in the states of Iowa and Guerrero. We are very thankful to all the people who have trained us, trusted us with their homes, and helped us succeed as a company. Our friendship endures. At times we may we fight like brothers yet we consistently work to bring our clients the best quality for a great price. We work with both general contractors and individual property owners.